A possibly incomplete probably medieval to post-medieval (1200-1800) copper-alloy mount, perhaps a book fitting, with a single integral rivet to the reverse. At one end of the artefact is a square, measuring 15.8mm in length and 18.6mm. Each corner has a pointed oval cut out, leaving a central cross with square ends. There are faint traces of gilding remaining within grooves which outline the pointed ovals, but not discernible anywhere else. The integral rivet protrudes to reverse of this square, measuring 9.7mm in length and 3.1mm thick. There is a slight notch at the end. Extending from the square is a long rectangular strip, which has been bent, and measures 41.1mm in length. The strip is flat, 1.0mm thick and is 5.8mm wide, tapering outwards slightly to 8.8mm. There is a small tear which can be seen on the back of this strip, near the bottom, but is more apparent on the back than the front. 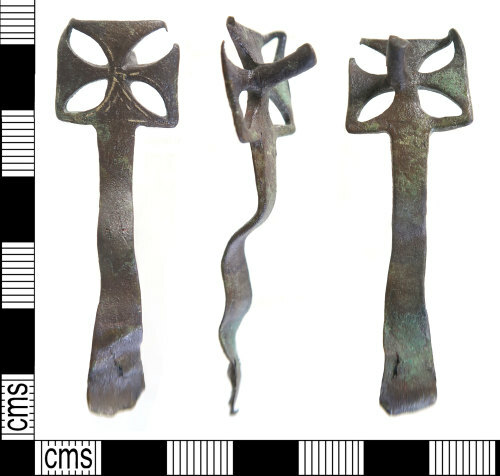 In total, the artefact measures 56.5mm in length, 18.6mm wide and weighs 5.34g.